Photo by Steve Maslowski/U.S. Fish & Wildlife Service Black-throated green warblers are nesting birds in the region. Other warblers wing their way much farther north to habitats where they prefer to nest and raise young. April kicked off with some excitement when I heard my first warbler of the spring season singing on the first day of the month from the woodlands near my home. Although I never managed to catch sight of the singer, I identified the bird as a black-throated green warbler by the whistled syllables of its song. 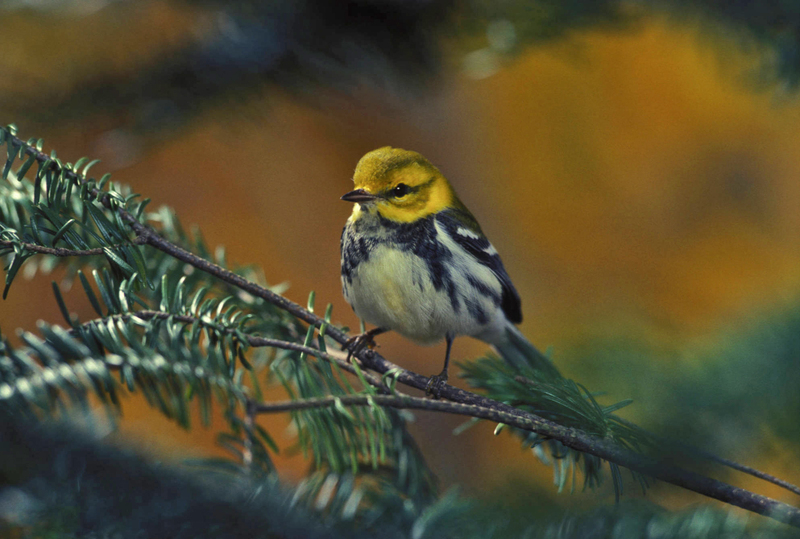 The black-throated green warbler is a common nesting bird in the region’s mountains. Warblers are exclusively birds of the New World. The majority of the world’s 118 species of warblers live in Central and South America, as well as in the Caribbean, but about 50 species spend the nesting season in the United States and Canada before retreating to southern strongholds for the winter months. Photo Courtesy of Jean Potter A male Hooded Warbler lurks in a thicket of rhododendron. The warblers have long been one of my favorite bird families, partly because of their ephemeral natures when it comes to visits in the region. Several of these small songbirds only pass through the region for a few weeks each spring and autumn as they migrate from their wintering grounds to breeding habitats spread across North America. The warblers are, for the most part, birds of the fast-moving, insect-eating persuasion. Many of these energetic birds will bypass the region except for occasional migratory stops as they wing their way quickly to bug-ridden bogs or coniferous forests farther north. 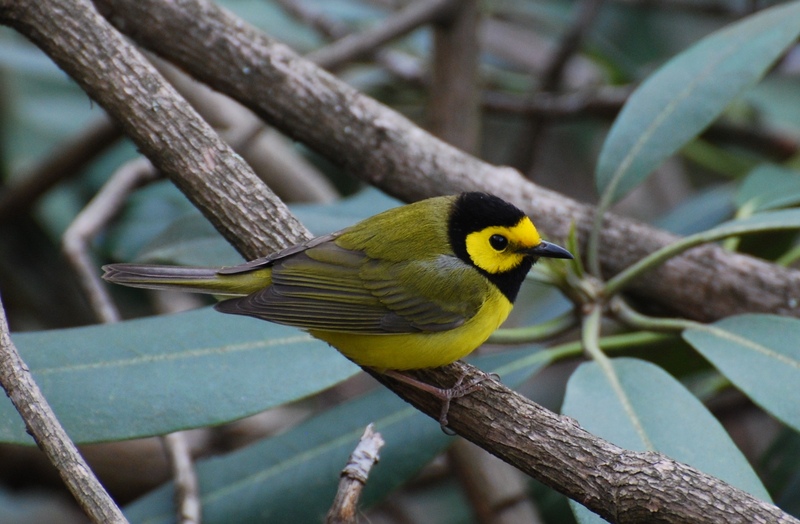 Species with names like mourning warbler, bay-breasted warbler and Wilson’s warbler shoot past northeast Tennessee and southwest Virginia in their haste to reach suitable habitat for raising young in the provinces of Canada or the New England states. The last verified sightings of Bachman’s Warbler took place in the 1970s and the species is probably extinct. A couple of endangered warblers — Kirtland’s warbler of Michigan and the golden-cheeked warbler of Texas — require extensive management by the federal government to protect their nesting habitat and ensure successful nesting. These two warblers, along with a handful of others, are the only members of the warblers nesting in eastern North America that I haven’t added to my birding life list. Only one of the warblers known to nest in the United States has ever gone extinct. Bachman’s warbler hasn’t been seen since the late 1970s, although there have been sporadic and unconfirmed sightings since the 1980s. 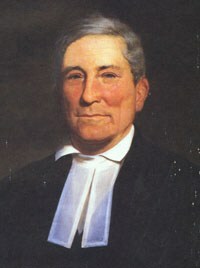 The bird was named in honor of the Rev. John Bachman, an early naturalist and friend of John James Audubon. The species was first collected by Bachman in his native South Carolina in the early 1830s. Historically, Bachman’s warbler bred as far north as Virginia, but the bird’s stronghold was in the states along the Atlantic southern coastal plain. Almost the entire population spends the winter months in Cuba. The disappearance of this small, yellowish bird has never been fully explained and will likely linger as a biological mystery. 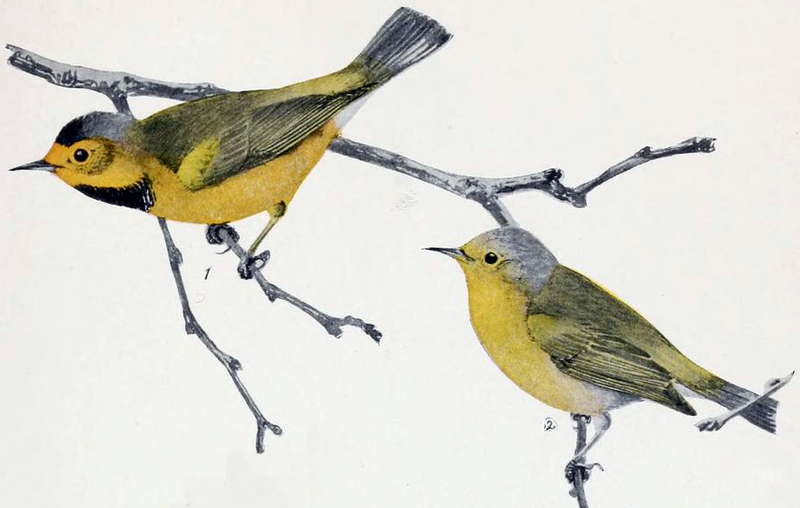 From its discovery to the plunge toward extinction, Bachman’s warbler was known for only slightly more than a century. 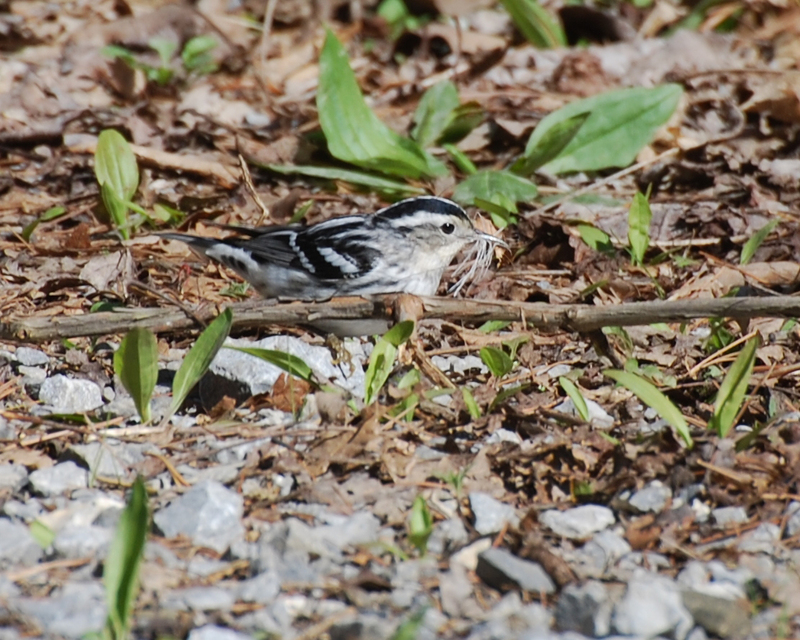 Photo Courtesy of Jean Potter A female Black-and-White Warbler gathers nesting materials. Most warblers have managed to adapt to changing landscapes brought out by human activity. Some, like the yellow warbler and the yellow-rumped warbler, are quite widespread. The yellow warbler nests across most the continental United States and also reaches Alaska. Closer to home, a few of these warblers nest in the woodlands around my house. The expected species each summer include hooded warbler, black-and-white warbler, ovenbird and Northern parula. I usually have better luck observing migrating warblers in the fall. I think part of the reason rests with the fact that warblers migrating in the spring are in a hurry to reach their destinations. In contrast, the fall migration is a more leisurely activity that affords these tiny birds the luxury of spending a few days in different locations. If one of those locations happens to be my backyard, I take great pleasure in getting my binoculars on species ranging from Kentucky warbler to blue-winged warbler. 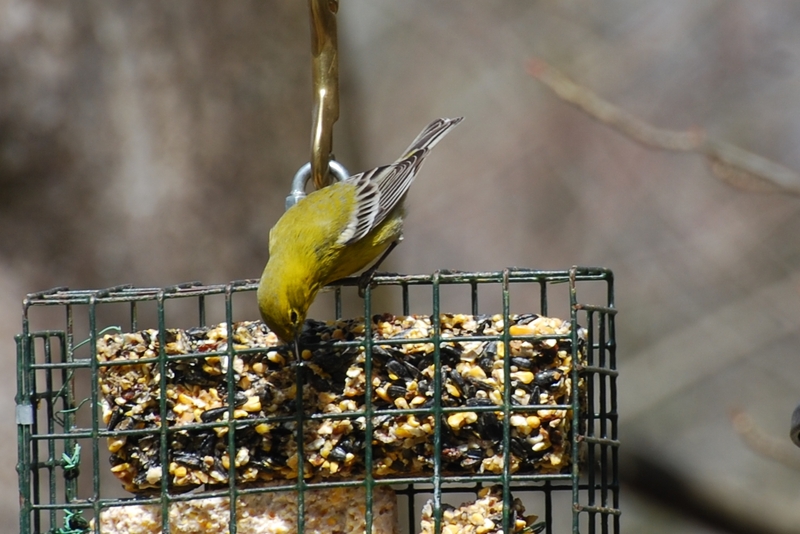 Photo Courtesy of Jean Potter A Pine Warbler visits a suet feeder. Most warblers ignore feeders, but these energetic songbirds will visit fountains and water features. Most warblers will ignore offerings at our feeders, although the occasional pine warbler learns the advantages of visiting suet feeders during the cold months. The most reliable means to attract these tiny, energetic birds is with a water feature, such as a bird bath, ornamental pool or even a bubbling fountain or artificial waterfall. On my property, I have a cattail marsh, a fish pond and a modest creek. As a result, I don’t spend much time working on providing supplemental water sources. For those not blessed with such resources, I highly recommend some sort of water source to increase your chances of visits from warblers. 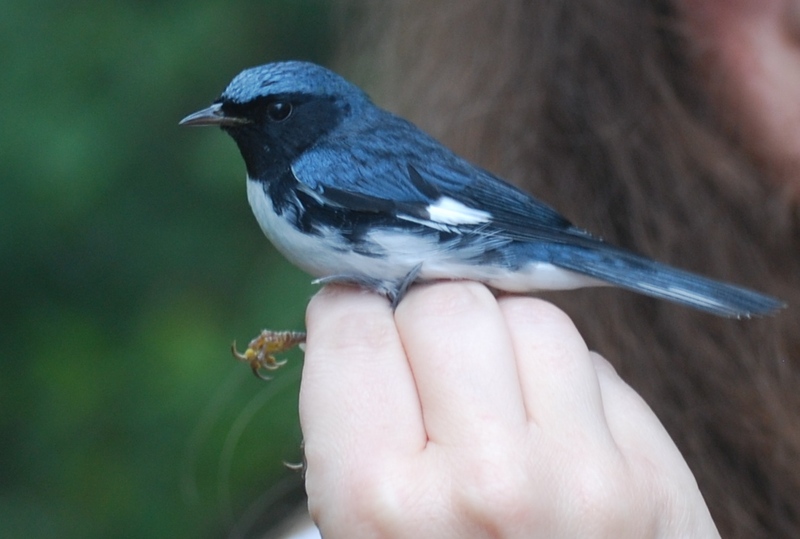 Photo Courtesy of Jean Potter A Black-throated Blue Warbler is captured in preparation for banding. These tiny birds are not the easiest ones to learn to identify. However, only about four dozen species migrate through the region or stop to spend the summer months. With a good field guide and some practice, it’s not that difficult to learn the different species. The reward is that undeniable spark of magic imparted by an observation of a bird as glorious as a fiery-throated Blackburnian warbler or a handsome black-throated blue warbler. This entry was posted in Birding, Birds, Spring birds, Spring migration, Warblers and tagged Birding, birds, Bristol Herald Courier, Bryan Stevens, Carter County Compass, Elizabethton Star, Erwin Record, Feathered Friends, McDowell News, Our Fine Feathered Friends, Spring migration, The Erwin Record, warblers on April 24, 2016 by Bryan Stevens.